"Breach of contract" is a legal term that describes the violation of a contract or an agreement that occurs when one party fails to fulfill its promises according to the provisions of the agreement. Sometimes it involves interfering with the ability of another party to fulfill his duties. A contract can be breached in whole or in part. Most contracts end when both parties have fulfilled their contractual obligations, but it's not uncommon for one party to fail to completely fulfill his or her end of the contract agreement. 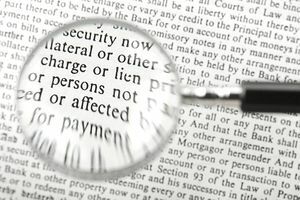 Breach of contract is the most common reason contract disputes are brought to court for resolution. A breach of contract suit must meet four requirements before it will be upheld by a court. The contract must be valid. It must contain all essential contract elements by law. A contract isn't valid unless all these essential elements are present, so without them, there can be no lawsuit. The plaintiff or the party who's suing for breach of contract must show that the defendant did indeed breach the agreement's terms. The plaintiff must have done everything required of him in the contract. The plaintiff must have notified the defendant of the breach before proceeding with filing a lawsuit. A notification made in writing is better than a verbal notification because it offers more substantial proof. Breach of contract can be material, partial, or anticipatory. A material breach is one that is significant enough to excuse the aggrieved or injured party from fulfilling his part of the contract. A partial breach is not as significant and does not normally excuse the aggrieved party from performing his duties. An anticipatory breach is one where the plaintiff suspects that the offending party might breach a contract by doing or failing to do something that shows his intention not to complete his duties. Anticipatory breaches can be very difficult to prove in court. Fraud: This means​ "knowing misrepresentation of the truth or concealment of a material fact to induce another to act to his or her detriment." When a defendant presents this defense, he's saying that the contract isn't valid because the plaintiff failed to disclose something important or because he made a false statement about a material or important fact. The defendant must establish that the fraud was deliberate. Duress: This occurs when one person compels another to sign a contract through physical force or other threats. This, too, can invalidate a contract because both parties did not sign of their own free will, which is a standard contractual prerequisite. Undue influence: This is similar to duress. It means that one party had a power advantage over the other and that he used that advantage to force the other to sign the contract. Mistake: An error committed by the defendant can't invalidate a contract and take away a breach of contract case, but if the defendant can prove that both parties made a mistake about the subject matter, it might be enough to invalidate the contract and this would serve as a defense. Statue of Limitations: Many types of cases have time limits imposed by law, deadlines by which a case must be brought and filed. A breach of contract case can be thrown out of court if the defendant can show that the statute of limitations has expired. Statutes of limitations cases are based on time frames that are set by individual state law so they can vary. They average from three to six years for a written contract. The plaintiff can be made whole in several ways if the other party is found to be in breach of a contract. In legal terms, this is called a remedy, and the most common remedy when one party is found to be in breach of a contract is monetary payment. Some other common remedies for a loss resulting from a breach of contract include damages and injunctions. Damages are amounts of money that compensate the victim for any actual loss he suffered. Punitive damages involve extra money a court might tack on as a form of punishment if the breach of contract was particularly egregious and intentional. An injunction is an order by the court that requires the guilty party to stop doing whatever action is causing damage to the other. A court might also order rescission of the contract. Sometimes the plaintiff has been so badly damaged by the breach that the injured party is allowed to rescind or terminate the deal. See an attorney if you think that the party you've entered into a contract with has breached it in some way. Law is intricate and small details of your case—things that you don't think are related or are a particularly big deal—can make a significant difference. Only a lawyer will be able to tell you if you have a strong case before you spend time and money launching into a lawsuit on your own—one that you could lose because of misunderstanding or an error. And, of course, if you're accused of breaching a contract, you'll want legal help to sort out the details of your case and to help you establish a defense.